Paru's Perceptions: Playing the Twofer challenge. I made these cards to play Darnell's brand new Twofer challenge!! The challenge calls for the use of one stamp in two different ways and for two different ocassions. 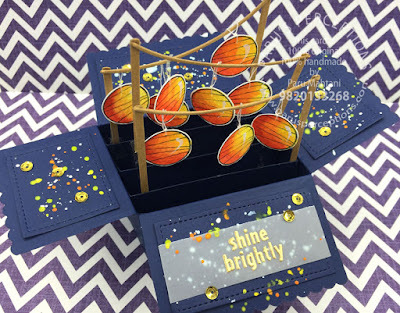 After, I made the cards, I went back to read the blog post more carefully, and realised I had to use a feather stamp!!!!!! 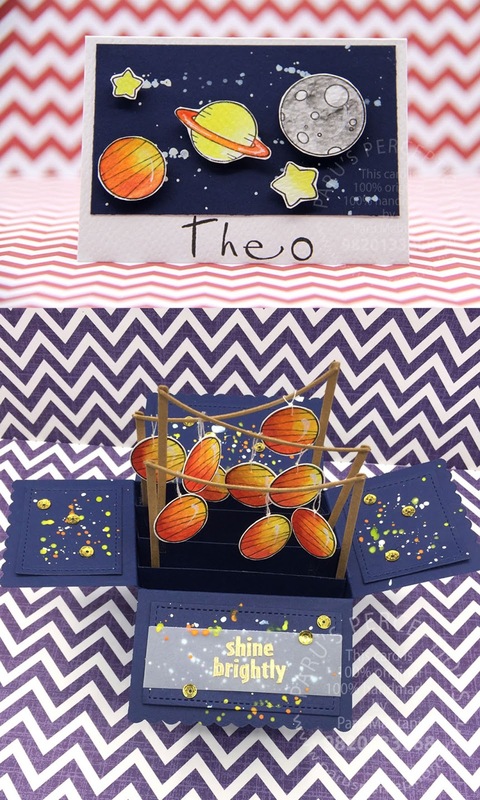 I have used one of the planets from MFT's 'Space Explorer' for two very different cards. 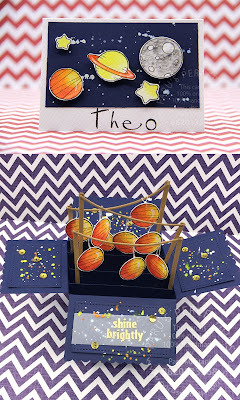 The first card is a personalised notecard made for a little boy who likes planets. 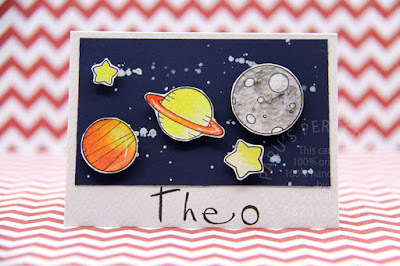 I stamped and water coloured the planets, fussy cut them and popped them up with double sided foam tape on a simple night sky background which I made by splattering some white acrylic paint on blue card stock. I adhered the panel on a 3"x4" note card with the boy's name stamped on it. I used Stampendous 'Retro' alphabet stamps to stamp the name. 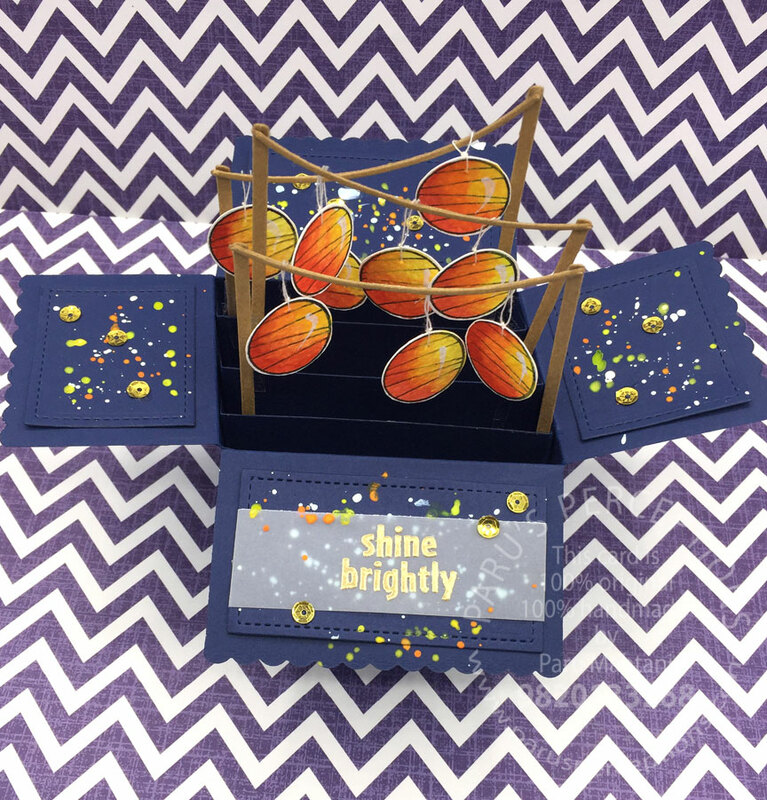 For the second card, I used Lawn Fawn's Scalloped Box card die with the same navy blue cardstock as the the card above. I stamped the planet multiple times and water coloured and fussy cut them to create lanterns. I die cut the banners from the Lawn Fawn set and then hung the 'lanterns' from them. Hanging the lanterns took a bit of experimentation. I sewed the string though each 'lantern', knotted the string and then sandwiched and adhered the string between two of the banner die cuts. This way they hang like real lanterns. 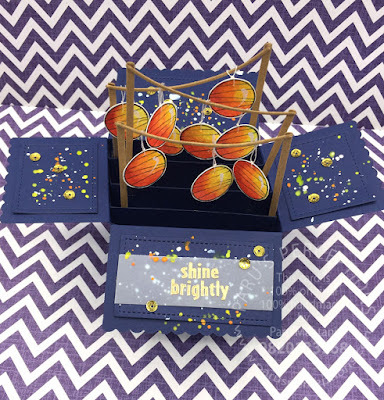 I added some coloured paint splatter to the box and added the shiny gold embossed sentiment and gold sequins to finish the card. I forgot to take a photo of the cards together, so here is a photoshopped image of the two, for the purpose of the challenge. Thanks so much for this new challenge Darnell!! It was TWO much fun! !